Pasting patterned paper or wallcovering onto your walls gives a nicer finish than paint alone. It can take a while to master the technique, but quality wallpaper will look good for years. Let the design you prefer dictate your choice of paper; most modern papers are relatively simple to hang. Paper-backed vinyl is harder-wearing than paper alone, as it can be scrubbed with a soft brush and wiped with diluted mild detergent. Embossed and anaglyptic paper is designed to be painted over, in either emulsion or gloss. It is a good choice for uneven walls, as it will hide surface irreg­ularities and is easily washed with mild detergent. Choose damp-resistant wallpaper for the bathroom and kitchen. If you are concerned about using the right amount of paste, choose ready-pasted papers. Simply wet the paper, by drawing it through water in the small trough supplied, and paste it to the wall. Avoid very thin paper; they may tear when you put them up and will probably not last as long. You’ll need a full day to paper an average-sized room. Read the hanging instructions printed on the back of the wallpaper roll label. Cut each strip with a safety margin for trimming and matching prints. To carry the wallpaper to the wall, fold the paper into a concertina-style, so that the pasted sides are facing, and then the unpasted, outside section is facing. Position paper up to the ceiling, leaving a couple of inches at the top for trimming, making sure any pattern is aligned. Line up the edges with a plumb line on the wall, and use a paper hanging brush to apply the top of the paper to the wall. plumb lines. Then go over the whole strip with the brush to remove any bubbles or wrinkles. If you find that you have bubbles or folds in your paper, do not be afraid to peel off the wallpaper and lay it again, in order to get it straight. Wipe excess paste off with a wet sponge (check in the instructions that this will not harm the paper). Repeat with adjoining strip, sliding it into place to match the pattern, if there is one. 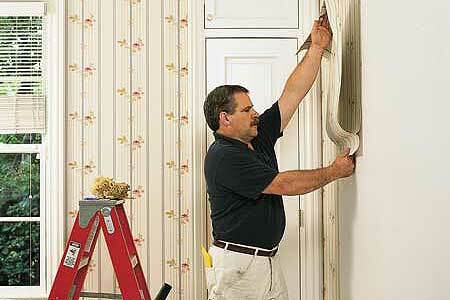 Trim the top and bottom once you have a few strips on the wall. On seams, don’t leave any gaps or overlap. Use a seam roller to firmly apply the paper to the walls, rolling over the seam once or twice at the most.